Why would a local church want to plant more churches? This is a good and very important question. People ask this question for a number of reasons. Some ask it because they are honestly curious and seeking to understand while others are resistant and seeking to push back against this idea. I believe there is a growing interest in being a part of planting churches across North America but sadly it is still a small minority of churches. So, many churches must still be convinced of the need and opportunity. But it is not only those who are not currently engaged who must be convinced but surprisingly many church plants themselves in time lose a real passion and drive to multiply and for a variety of reasons give themselves to other activities. Therefore, we need to re-convinced ourselves of this very important engagement in our world. It has always been God’s desire and design that local churches would multiply. We see this from the Great Commission and then throughout the Book of Acts and so many of the epistles. We see the church in Antioch join in this great mission of actively engaging in planting. Churches planting churches is how the gospel most often spreads and impacts communities. Planting Churches makes the gospel more accessible. When we plant churches we are seeking to see a new church take root in a community where there was less access to the gospel. In our culture today, Christians are often willing to travel some significant distance to attend a church. So, they may drive several miles passing multiple towns or in a city ride the subway multiple stops to attend the church where they are engaged. However, it should not come as a surprise that people who are not Christians are much less likely to be willing to travel a significant distance to attend a church. They may be willing to travel one community over but very often we find that they are primarily open to attending a church service if it is in their community. So, in order to reach the people in a community, we want to plant a church within their town and in their neighborhoods so they may have more direct access to a gospel community. Planting Churches makes gospel community more accessible. We see throughout the New Testament that God desires for a certain type of unique community to be formed in the local church. This community is not confined to service on Sundays and it is intended to be for the building up of the believer but also to be an attractive picture of the power of the gospel in this new family that the gospel is bringing about. The greater the distance that people have to travel to engage in their local church the more difficult it is to be deeply engaged in the ongoing life of the church. Closer proximity doesn’t guarantee the presence of rich gospel community but it does remove one of the primary obstacles. Planting Churches enriches and stretches a church. When a local church invests in planting other churches it will enrich the life of that church in so many ways as this great challenge and vision challenges and mobilizes the church. It will demand that leaders be raised up, prepared and sent out. The vision can at times call out some who have been less engaged who may be invigorated by this vision so that people who don’t normally serve and engage may step into roles that are created in the new or existing church. It will stretch the leaders and staff of the church in many good ways. There can initially be resistance in the idea of planting but very often in time excitement grows in the planting church as people are reminded of one of the central reasons that their church exists. Planting churches multiplies future laborers. When we plant churches we multiply future laborers. In the short-term, laborers have to be multiplied for the planting of the church but as we think more long-term we see additional multiplication of workers in the field. In time the church plants grow up and become engaged in congregations who join in the work of the gospel and hopefully multiply themselves in the future. Then you have an additional congregations joining in all the same efforts of multiplication. Planting churches forces us to look away. Planting churches is costly and that is good. There is no question that planting churches are typically financially costly. They will cost the existing church in numerous ways. But it is worth it. The planting church may very likely have to make sacrifices and even cutbacks for a time in order to plant but often this mission stirs deeper generosity from the church members. And no matter the cost, there is no better reason even if it leads to some short-term tightening of the belt if the result is another congregation. Individuals within a congregation and the church itself may often find themselves stirred by this new shared mission of planting and where interest and generosity has waned this new endeavor can stir a renewed desire to sacrifice. Planting churches expresses trust in God and glorifies Him. Why would a church want to plant churches? 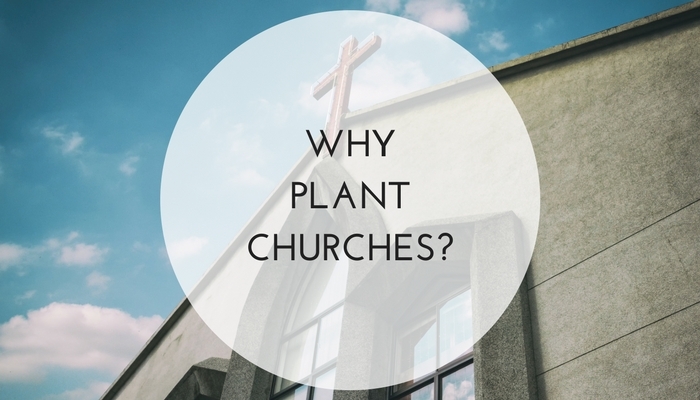 Perhaps the better question might be “why wouldn’t a church want to plant other churches?” Friends, it is truly a worthwhile pursuit for every local church. May God stir up many church planting churches across our nation and around the world for His glory! How Do You Plant Churches?